For your convenience, you can rent bikes directly from the Sandalfoot office! 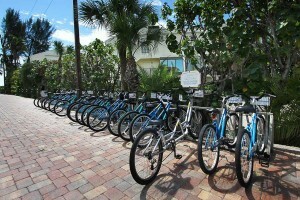 Billy’s also offers a full range of bike rentals, scooters, beach, and specialty items. For a popular new Eco-Friendly way to see the island, try hopping aboard a Segway scooter also available from Billy’s Bike Rentals. Enjoy a 90-minute tour of Sanibel Island on Segway’s. No experience necessary! Please call in advance for reservations and guided tour schedules. With more than 65 miles of bike trails, it’s important to take a moment to go over some important regulations. These trails are also shared with walkers, rollerbladers and joggers, so they’re important to observe. Signal your moves to let others know your either slowing down turning or stopping. Give right of way to pedestrians. Take extra care at driveways, especially along commercial sections on Periwinkle Way. Rent performance road bikes and shop for bikes, accessories and clothing. Flat tires repaired while you wait. Expert repairs, island-friendly advice. Rent bicycles daily or weekly at great prices. Hourly rentals available. 1- and 7-speed bikes; 21-speed comfort bikes; bikes for children; joggers; child trailers; trail-a-bikes; 4-wheel bikes with canopy; tandems; also, adult trikes and recumbent bikes & trikes. All bikes come with bells and baskets. Baby seats, maps, locks and helmets provided free of charge. Delivery and pickup for a multi-day rental upon request. Also available for rent are metal detectors, tennis rackets, beach chairs, beach umbrellas, fishing equipment, boogie boards, skim boards and paddleboards. Open daily 9am-4pm.